We have developed a unique sourcing strategy based on our ethical principles. This guarantees our timber products are as sustainable as it gets. Our timber products come mostly from urban or woodland treework arisings (which is the most frequent source of our unusual species), but we occasionally buy-in timber to meet our customers’ requirements. TreeStation timber products start life as unprocessed green timber in the form of tree trunks arriving back at our premises. The first step is to assess the best use of each trunk, and stack it in the correct storage area at the TreeStation. The downside of using urban-grown trees for timber is that trees are often used to attach fences, washing lines etc. 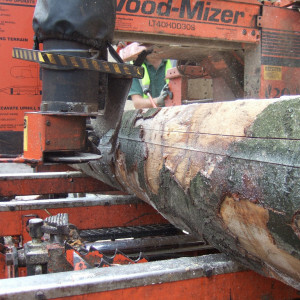 As a result, we sometimes encounter foreign matter in the timber remove this using a high specification metal detector before it gets milled. The metal-free trunks are then loaded onto a professionally-operated Woodmizer bandsaw mill, and skilfully cut into the most appropriate size and types of sawn timber. The sawn timber must be left to air-dry with special spacing sticks between each board, before it is then kiln-dried by a specialist timber kilning company based in Pendlebury. 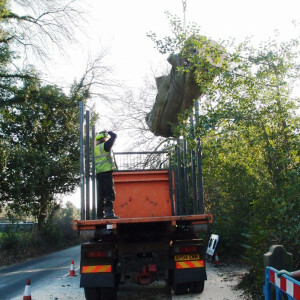 On its return to the TreeStation, the kilned timber is checked over and placed into storage racks under cover. Our joinery and cabinet making customers are able to hand-pick individual boards to best suit their project, delivery being made using the most suitable vehicle from our fleet.